DeDee Cai is founder and CEO of Fit to Profit, a coaching business that combines psychology, cognitive science, holistic wellness, physical training, and business to help executive leaders and entrepreneurs. After experiencing burnout from her corporate career in recruitment, DeDee stepped back and repurposed her skills for something more reflective of her values. Now, in addition to being a WERKIN mentor, DeDee is reenvisioning how people think about personal success, fitness, and mental health. WERKIN recently organized an Ask-Me-Anything call featuring DeDee to share her advice with mentors and mentees from BEACON, a community of women entrepreneurs in Washington, DC. WERKIN: What led you to your current position? DeDee: I founded Fit to Profit to offer consulting services to executive leaders. We offer holistic business coaching where we give every single leader the foundation to personally and professionally succeed. But starting the business has been a personal journey. I, like everyone, had a preconceived notion of what it meant to be successful, and did everything I was told to do to reach that preconceived notion of success. I went to university, I graduated, I was hired into a really great job. 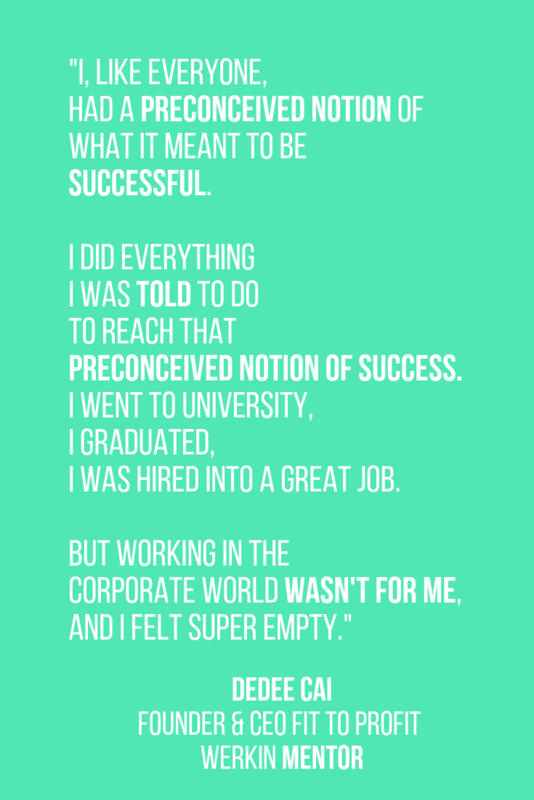 But working in the corporate world, I realized it wasn't for me, and felt super empty. I embarked on a journey to figure out my own definition of success. And decided that opening my own business was what I wanted. So, I went off and opened businesses with my family. We had a salon business, and also a restaurant business. After about five years of that, I realized that yes, owning my own business was the dream. But being in the service industry and the long hours that are required, I had no work-life balance. Again, I had to rethink how I was living and working. After all those years in the corporate world and having my own business, I completely burnt out. I didn't know what I was supposed to do, whether to continue my business, or go back to corporate. This uncertainty led me to coaching. Teaching myself mindful ways of living, how to manage my own stress with diet and exercise, and just taking care of myself, got me to holistic life coaching. I got certified, and from there, I've been practicing, coaching myself. At the same time, sharing my story and my trials with other people, people started asking me to help them with their own challenges. When I started my business, it was strictly business coaching, brick and mortar small businesses, helping people start and build their ventures from the ground up. After doing that, I realized that most of my business owners always hit a patch where they stall and have to rebuild again. They weren’t managing their business in a mindful way, they were neglecting themselves. In the past year, I really discovered that while it's important that your business is profitable, you have to make sure that you are taking care of yourself and not losing yourself in the process. It is a personal journey, with many challenges in my own life and realizing that success is different for everyone. Revenue is one measure of success, but I have some clients who are doing well with their bottom line, but have no personal balance. Defining your own measure of success and how to achieve it, making sure that you don't lose yourself, that’s what Fit to Profit is about. I built my business on the basis of freedom, running a business while living life as you choose. We are a movement that is making the connection between fitness and profitability, understanding what we need, and being personally aligned with our business. WERKIN: You were able to turn this burnout into not one, but two new ventures: moving from your corporate career to starting small businesses, and now as a coach. How would you say those past careers shaped what you're doing now? DeDee: Ironically, I was a corporate recruiter, matching the ideal job to the ideal candidate, as I was struggling with my own place. I have experience placing people where they need to be, in terms of their technical skillset, who they are as people, and what they are looking for in workplace culture. That experience taught me how to have the right questions. I know how to prepare people to interview successfully and how to find a workplace culture that aligns with their values. That experience helped me when I opened my own business. I knew exactly how I was going to find and hire the right people and how to manage a healthy work culture for the company. I also have a background in cognitive psychology, which helped when I got into coaching. My experiences helped me see my clients for who they are, understand what they're looking for, and give them the right strategies and tools to take their businesses to the next level. All these strategies are customized to each client’s lifestyle and their business model. Sometimes when you look back, everything makes sense, you can connect the dots. Everything I have been doing is exactly what I needed to do to have the experience to be a coach. WERKIN: So it takes that clarity of mind to reflect on your diverse experience, and then turn it into helpful advice for others through coaching. Do you consider yourself good at giving advice? DeDee: I appreciate the question so much. Before I became a coach, or even discovered the coaching industry, I was the person that my friends and family went to every time there was a conflict or they needed to talk through something. I was the person that my family and friends considered a really good listener. Do I consider myself good at giving advice? Yes. Because that's my business right now. My past experience in corporate recruitment provided me tools and concepts that I could use to get started. WERKIN: So you took a natural quality of yours, a skill that you were comfortable with, and turned it into a valuable service. What was it like working with your family when you were starting those businesses before your coaching career? DeDee: It was interesting. It taught me to set boundaries: a physical boundary, a mental boundary, an emotional boundary, and a spiritual boundary, because my mother was my business partner. I had to set boundaries, "yes, I am your daughter, at the same time, right now I am the CEO of this company.” You need to be able to separate your business from emotions when working with family. This experience also gave me what I needed to organize a business model. Would I recommend working with family? I wouldn't. Things can get emotional working with family. But it’s doable. WERKIN: If we're lucky enough, we have mentors at different stages of our career. Have you had mentors? How have they shaped your career path? DeDee: Depending on where you are in life and business, you need different types of mentors. A mentor can be someone you look up to, a confidant, anyone that you want to learn from. I started working when I was very young, my very first manager was my mentor. The best thing that I learned from her, that really gave me the foundation to have the grit to do what I do, she told me, “you have got to work harder than any one of your employees.” That was my first mentor. When I first started coaching, I did not know what to do. I knew there were many things I did in the past that could have been better. I just wanted a roadmap to get to the next model of success. So I hired my very first coach as I launched my business. That coach was a source of accountability for me. Often as a business owner, it's easier to find the information. But the implementation process is more challenging. Have someone there for you to confide in and to believe in you when you don’t believe in yourself. She kept pushing me to do what's uncomfortable until one day I realized that I'm actually capable. There's always a way to find guidance. It doesn't have to be a paid coach but have an accountability partner. Beyond coaching, I cannot stress enough the importance of having at least one mentor. WERKIN: Where would you say your business is now and where do you want to take it next? Where do you draw your motivation from? DeDee: Oh my gosh I love this question. Where is my business now? When I first started my business, I envisioned having the flexibility to work when I wanted to work and spend time with my family. I created this business on the basis of freedom and being able to do what I want to do, and be really focused, passionate, and in the zone when I need to be. It is exactly where I envisioned it three and a half years ago and more. The relationships I've built are tremendous and they keep coming. The business has created space for me to learn. Where is my business going? Perhaps this is a good opportunity for me to put it out there. I envision my company, and any other similar coaching and consulting company, to be so accessible that mental health services are not just something that a therapist does. Just as we learn how to take care of our physical health, through a gym membership or healthy diet, I envision a world where every person can learn how to take care of their mental health. How do I keep myself motivated? I have a system to take care of myself. My outlet is mindfulness in my yoga practice, keeping myself physically fit with my long-distance training and running. I take very good care of myself, having the right nutrition, I sleep well. I’m constantly building my relationship with my family, friends, and colleagues, and I'm connected to my spiritual practice. You have got to figure out what refuels you. We're in a culture where it's normal to go, go, go; working so many hours, from one task to the other. You multi-task, you do as many things as possible. I can tell you, less is more. Focus on the one thing that really drives and energizes you. Take a step back. Whether you are taking a dance class or playing an instrument, whatever it is that you love to do, that's the time that your mind, your body, and your spirit need to recharge. Go back to what essential, take care of yourself first. Taking care of yourself also means prioritizing mentoring to take yourself to take the next step.